This letter was written by Capt. Ira (“Ike”) Ayer, Jr. (1836-1903) of Co. I, 10th Pennsylvania Reserve Corps. He was the son of Ira Ayer (1802-1889) and Julia Mariah Wadsworth (1808-1861) of Erie County, New York. 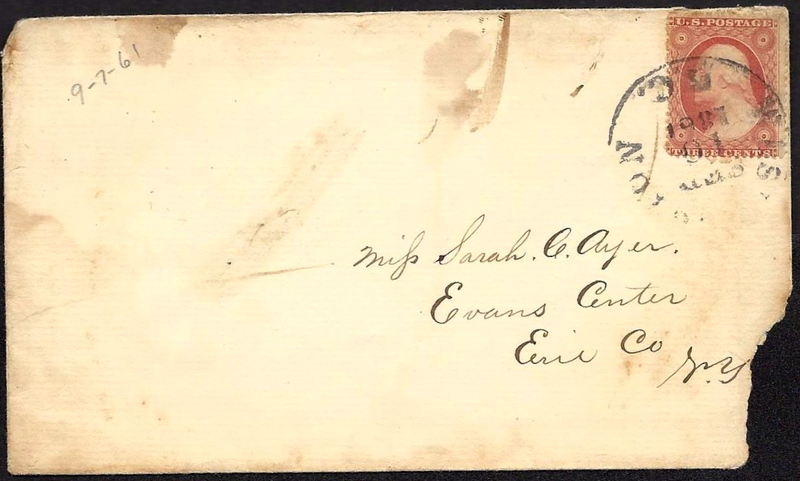 He wrote the letter to his sister, Sarah (“Sade”) Cecelia Ayer (1842-18xx) who became a school teacher. The letter was written less than a month after their mother’s death on 14 August 1861. In the battle of Beaver Dam Creek [Battle of Mechanicsville] he was sent forward with his company to occupy the skirmish line, and remained in this advanced position during the entire engagement, the regiment acquitting itself in the most gallant manner. “About ten o’clock,” he says, “the roar of artillery had ceased. In our advanced position we could hear distinctly the movements of the enemy, and the cries and shrieks of the wounded and dying, as lay where they had fallen or were being moved from the field.” In the battle of the following day, at Gaines’ Mill, he received a gunshot wound in the right side and a severe contusion of the right arm. “Colonel Warner,” he says, “mustered the regiment on the 30th, and I shall never forget the glow of soldierly pride with which he commended the company’s bravery, and viewed its thinned but still compact ranks.” And now came the change of base, with infinite discomfort to the wounded and worn-out soldiers. But a place of rest had not been gained before the enemy attacked, now at Charles City Cross Roads. The Reserves felt the first shock and were terribly scourged, but suffered no diminution of gallantry. In the Seven Days of this contest Captain Ayer’s company lost more heavily in killed and wounded than any in the division. As it was the representative of one of the prominent colleges in the State, the fact may be regarded as significant. At [Second] Bull Run, Captain Ayer received a severe wound. Passing over this field nearly a year afterwards the recollection of the battle were brought vividly to his mind and he thus wrote to a friend: “A little farther on we came to the scene of our last year’s operations. There is the very field where we lay, Thursday night, August 28th , all day under a hot sun, covered a little from the enemy. This was near Groveton. Yonder is the wood where our regiment made a charge to take a rebel battery, but without success, and there is the field where they shelled us after dark, throwing their missiles very accurately, but, as it happened, without effect. That was Friday evening, the 29th; and there is the field where our regiment stood picket the same night. Passing on a little farther we come to the house hear which we lay Saturday, before we were ordered into the engagement. But here to the right is the very spot where the regiment fought. There fell Captain Hinchman, of Company A, and it is said that he is buried in that little rail enclosure. Here, too, fell Tryon and Pearl; and Phelps, out Lieutenant, a bold and dashing officer, was shot through the breast. No better men graced the ranks of the Union army. On this same ridge the rebel bullet struck my arm, and another went through my hat. The former made a sad hole in my canteen, causing all my cold coffee to run out. The boys in going over the field to-day found what they asserted to be the self-same canteen; but they were mistaken, for I carried it off with me.” His wound was a severe one, fracturing the left forearm. At Gettysburg, while reconnoitring, he was fired at by two sharpshooters from an unexpected quarter, but was not hit. Turning suddenly back, a third shot was fired, which just grazed his side, making a deep abrasion, and would have done certain execution had it not been fired at the instant of his turning away, carrying him out of aim after the missile had actually left the piece. For more than a year after the Reserve corps had completed its period of service and been mustered out he was disabled. 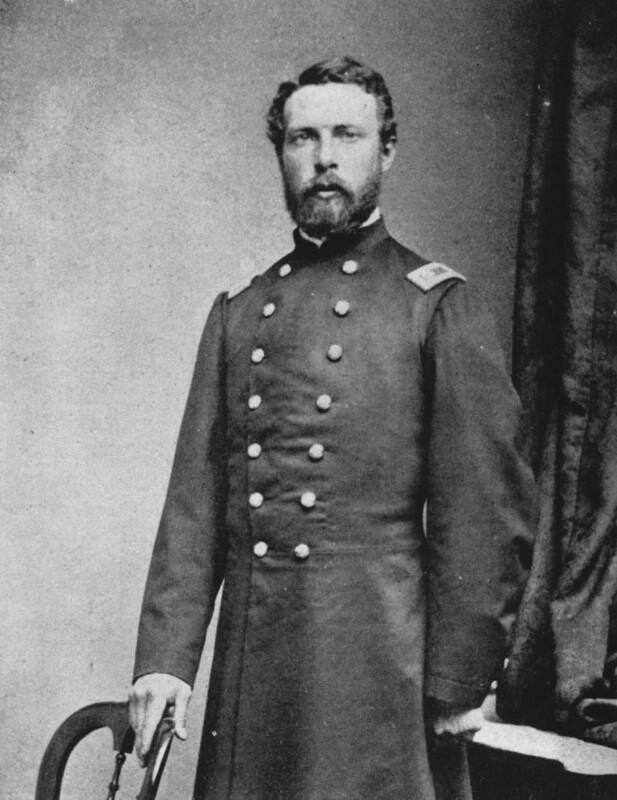 He was brevetted Colonel for this action, and was warmly complimented by Generals Crawford and Fisher. Only by wounds, however, was he kept from the field, possessing a good constitution and actuated by real patriotism. In person he is six feet in height, well formed, and of fair complexion. At college he manifested a strong liking for mathematics and natural science, and later in his course for lingual studies. Strictly temperate–of tobacco and spirituous liquors abstemious–he was little affected by temptation, as the habits of youth are strengthened and firmed by time. Colonel Ayer was married on the 21st of December, 1863, to Miss Jennie James, whose mother had, during the war, ministered at the bedside of many sick and dying soldiers, evincing a patriotism as sincere and fervid as the man who bore the musket and met face to face the foe. She watched at the side of one of the brave men of Ayer’s company, Edwin B. Pier, a scholar of promise, and after his death wrote a most touching letter, descriptive of the Christian fortitude of the departed young soldier. When Ayer next visited Washington, he called upon the family to tender his acknowledgments for the kindness shown his beloved companion-in-arms, and then for the first time met the daughter. The acquaintance ripened into esteem, and finally resulted in their marriage. 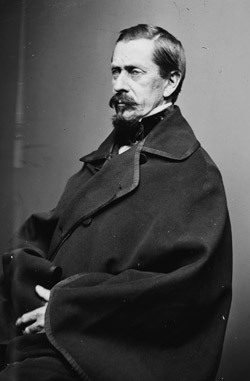 At the close of the war, Colonel Ayer settled in Virginia, and now resides at Norfolk, where he holds a responsible position in the civil service of the General Government. This letter is datelined Camp Tennally which was near Tennallytown, D. C., northwest of the nation’s capitol. The 10th Pennsylvania Reserve Corps had been bivouacked there since 1 August 1861, guarding the northern approaches to the city. It is a warm and very pleasant day. A light breeze is spring up from the North driving fleecy-hazy clouds across the sky, and fanning your brother’s brow as he pens this missive to his absent and loved sister. Sister; imagine for one moment your Ike’s strong arm around your neck and feel the impress of his kiss upon your check. Though friend must be separated far from friend in this world, how blest that that sweet union off his spirit can never be broken which so softens and sanctifies life. Were it not for this, I should have no sisters now — no Father — no Mother. As it is, Mother yet lives to me; sisters are often near me; and the influence of a beloved father is ever surrounding me. Let me tell you how glad I was for so faithful an account of our sainted mother. I am not surprised, dear Sade, at your temptations during the trying hour. It is perhaps but natural that reason should arise and shake herself and clamor for admittance to those portals which faith alone can enter. Are we not firm; do we not say, “Reason; thou can’st go no farther: thou hast naught upon which to plant thy feet: stand back and let bright pinioned Faith bear on my hopes.” We need not wonder to find ourselves enshrouded in clouds and darkness. But experience, dear sister, will strengthen us in the exercise of faith and enable us, if we seek earnestly for so high a state of grace, to ever live in the sunshine of a glorious hope. It is generally felt, I believe, both in the army here and throughout the North that we are on the eve of a great battle. We have received an order from Gen. McClellan this evening to have two days rations in haversacks and be ready to start at a moment’s warning. This looks significant as I think there is very little cause to suspect an advance on the part of the rebels. Next week, I think, will be fraught with stirring events. This afternoon Gen. [George Archibald] McCall’s Brigade to which we are attached was reviewed by the Secretary of War. They made a fine appearance and I believe will do good service. I am learning to live as comfortably in my tent as at home. Indeed, it is a very pleasant mode of life. The reveille and tattoo are beginning to come as a matter of course, just as the crowing of the rooster in civil life. My health is for the most part excellent. The severe cold which hung to me so long I am entirely free from. I never was more grateful to be relieved from any illness than from it. Your plans, dear S., entirely meet my approval. I doubt not they are dictated by divine and filial love. Can you doubt for a moment that you will not prosper in every way in pursuing them? Have you a fear even that you will not succeed? Where is thy faith, loved one? Look to the lives of the great and good in all ages. They, like you and I, had to overcome foes from without and within. And yet it was only by these conflicts that their souls became strong. Dost thou have trial? Let thy faith mount upward as on the wings of the eagle. Let it bear thee to that world of eternal day. Behold then thy Savior, the ever blessed comforter. Claim his promises. Get strength by communion with the Father. With thine eye upon the star-decked throne and the swaying scepter, go forward to battle. Nothing can harm thee so thou dost not falter or delay. Adieu for the present. Love to all. This entry was posted on Friday, May 30th, 2014 at 10:52 pm	and posted in Uncategorized. You can follow any responses to this entry through the RSS 2.0 feed.